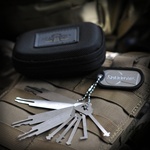 The Sparrows Coffin Keys set consists of 13 rocker picks of various sizes. 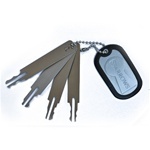 Coffin keys work in a wide variety of wafer and pin tumbler locks. The picking action is simply insert the pick into the keyway while rocking the key up and down at times apply torque to the key by turning it gently. Slide the key in and out while also trying a different size and patterned Keys. 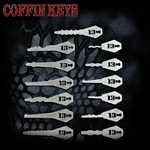 Coffin keys are a mix between picking and using a skeleton key.